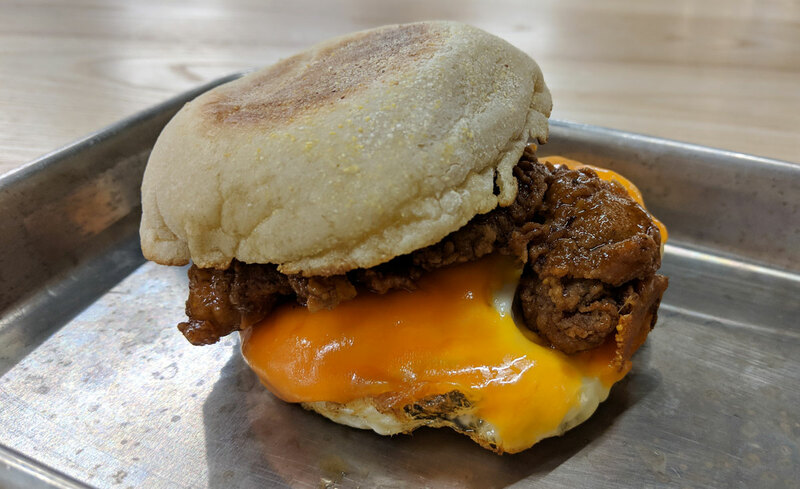 Fried Chicken Breakfast Sandwich at Porchetta & Co. 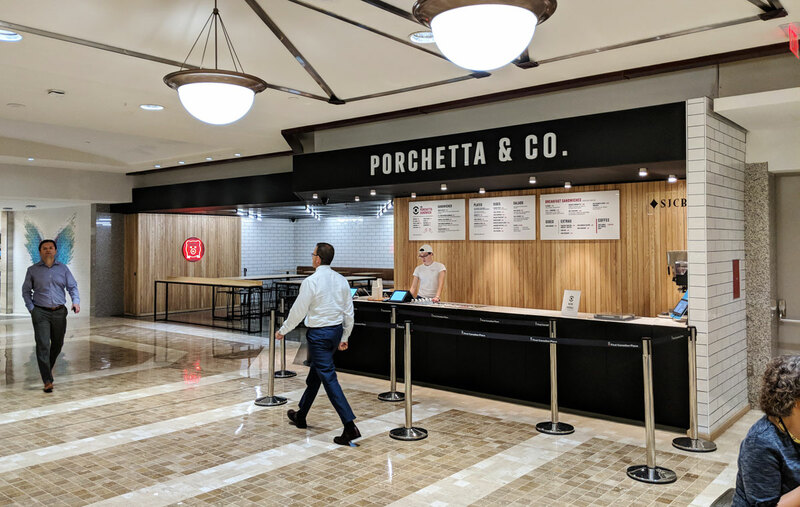 The Exchange Tower location of Porchetta & Co. is a bit different from the other ones — it opens early, and it has a breakfast menu. This menu includes a buttermilk fried chicken sandwich. Fried chicken in the morning? Yes please. Sadly, it’s not quite as great as you’d hope, but it’s fried chicken, an egg, and gooey cheese. Of course it tastes good. How could that combo not taste good? Like all of the fried chicken at Porchetta & Co., the chicken here is perfectly cooked, with a satisfyingly crispy exterior. It’s dipped in hot honey, with a very strong emphasis on the honey. It’s sweet. I wish there were a bit more spice, and maybe some vinegar to cut the sweetness, because it’s tasty, but it’s a bit cloying. The egg was overcooked, with a chalky yolk — but other than that, the sandwich was solid. 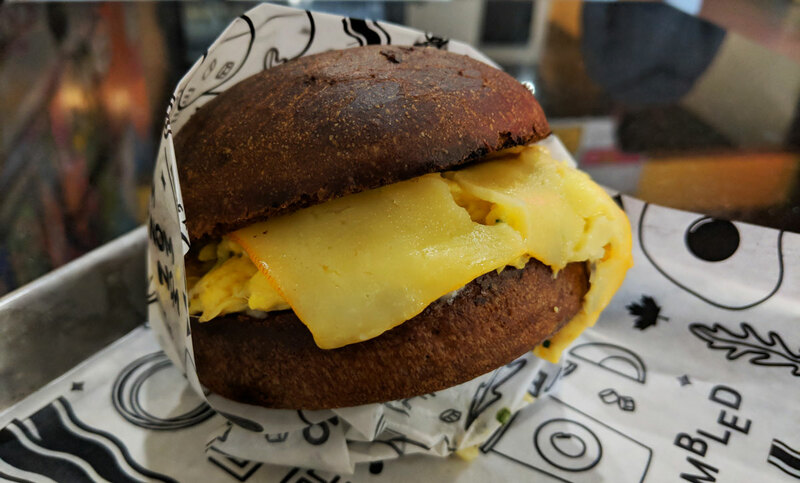 The cheese was nice and melty, and the buttery toasted English muffin was the perfect vehicle for the chicken, egg, and cheese. 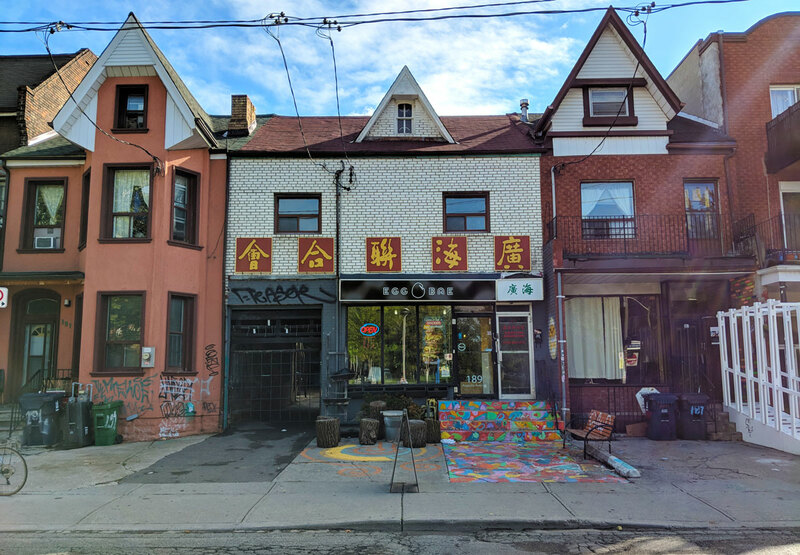 I’ve been meaning to check out Egg Bae pretty much since it opened, though I’ll admit that the name kinda makes me cringe. I can’t help but think about this moment from 30 Rock every time I see it. But regardless of the name, I just can’t say no to a tasty breakfast sandwich. Who can? It’s decent enough, but alas, it didn’t quite knock my socks off. 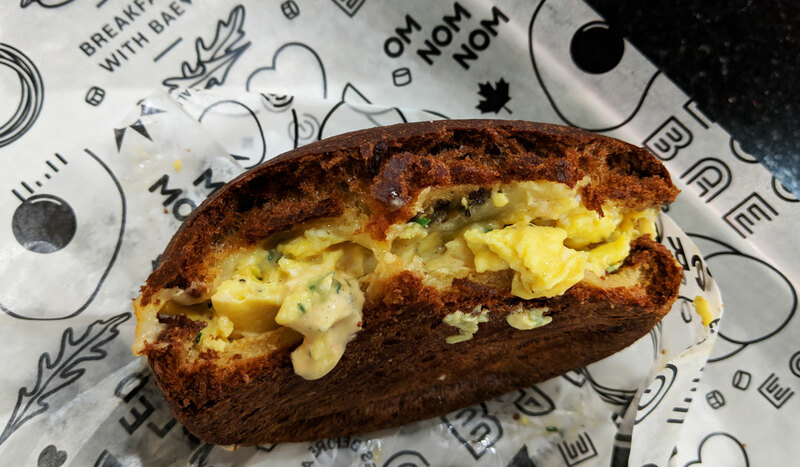 All of the components are really good (in particular, the eggs themselves are perfect — they’re amazingly soft and creamy with zero sliminess), and the hearty bun does a great job of holding up to the very gooey sandwich. But all of the flavours and textures are basically on the exact same wavelength; it’s one-note soft, salty, and rich, and as good as it is, it gets monotonous. It really needed some texture to balance out how soft everything is, and something acidic to cut the richness. It’s not a large sandwich, and I was still sick of eating it towards the end. 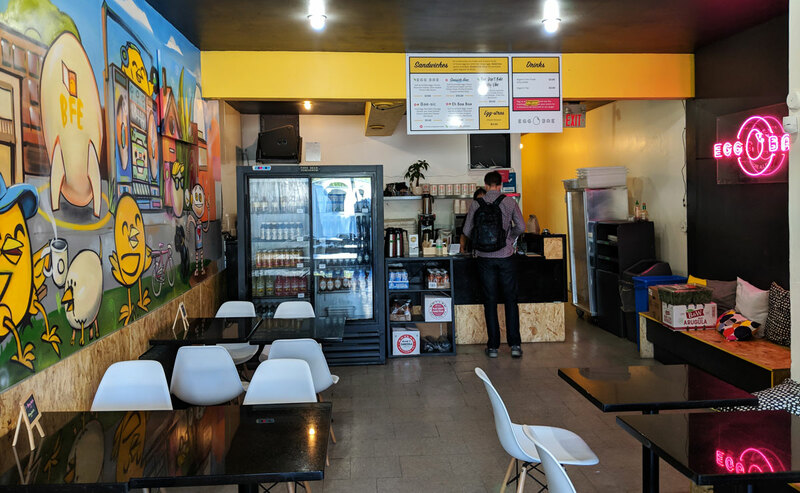 Certainly, Gold Standard, which serves my current favourite breakfast sandwich in the city, remains the… well, gold standard of breakfast sandwiches. This will probably flush my credibility down the toilet, but I think even a McMuffin is better (I’m partial to the Egg and Sausage). 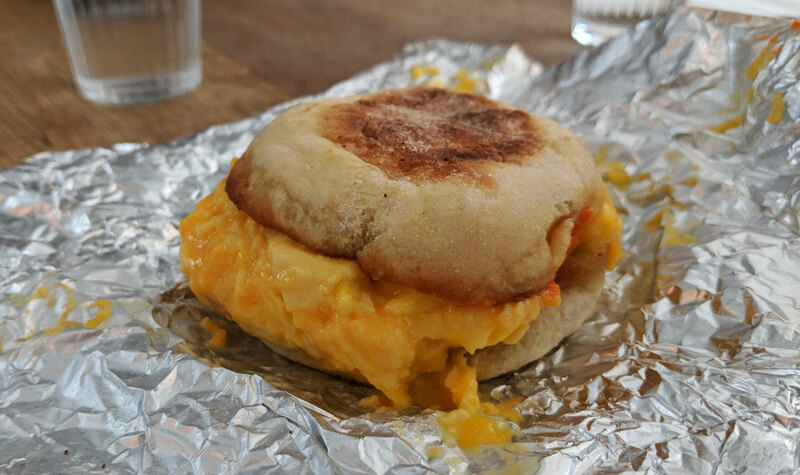 Yes, the quality of the ingredients at Egg Bae are clearly superior and the eggs are better prepared, but the McMuffin is just more satisfying. The toasted English muffin gives it some much-needed textural contrast, and the flavours are better balanced. 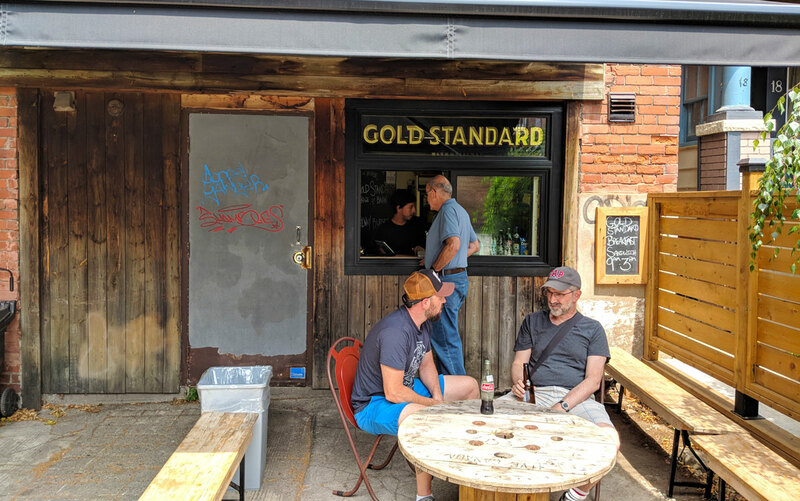 I recently tried the burger at Gold Standard, and while I enjoyed it (and appreciated that a Toronto burger joint was finally serving an American-style slider), I wasn’t blown away. Well clearly, the breakfast sandwich is the thing to order, because that one? That blew me away. I really should have cut it in half so that you could see its glorious innards; it doesn’t look like much in that picture, so you’ll just have to take my word that everything was well-proportioned and perfect. All the components work so well together. The perfectly cooked egg and the gooey cheese meld into something that’s downright magical. The generously-applied crispy bacon adds texture and a meaty saltiness. The mild kick from the hot sauce along with the vinegary bite of the pickles cuts the richness of the cheese, the bacon and the eggs. And the soft, fresh, perfectly toasted English muffin holds it all together (and adds a light crispiness) without getting in the way. Best breakfast sandwich ever? Quite possibly!